Your site doesn't need to have a blog, and you can skip this section if you don't want to have one. 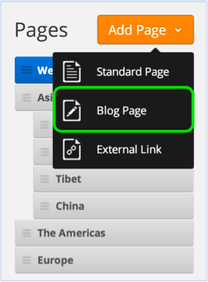 To create a blog, go to the Pages tab of the editor, click Add Page, and select the Blog Page option. Give the blog a name (if you want to call it something other than "Blog") and then click Save & Edit to start adding content. A new blog starts with a sidebar and some default content that you can easily change, and also gives you the option to add a New Post. 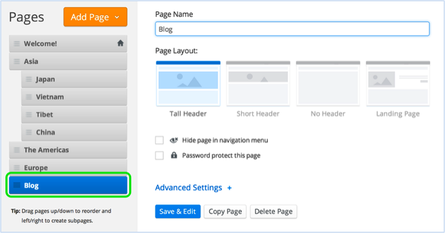 To create a new post for your blog, use that New Post button. Your blog post has a title and a content area. The title should generally be short - no more than a sentence long or so. 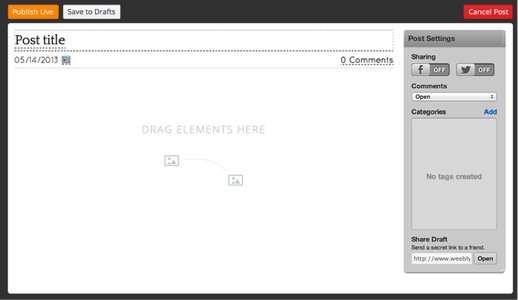 The content area includes a basic paragraph element which you can either edit or delete. 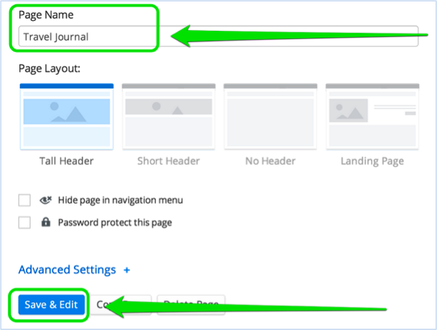 Adding content to a blog post works the same way as adding content to a regular page - just drag elements into the post and edit them to add content. Once you've added your content you can categorize the post - these categories will appear on your sidebar, making it easier for visitors to find posts that cover specific topics. 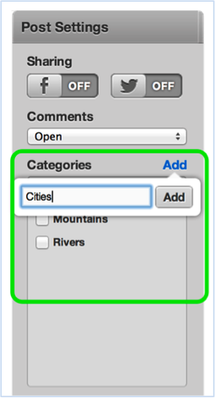 Categories can be whatever you like and it isn't necessary to use them. If you do use them, we'd recommend having no more than twelve different categories on your entire blog. When you're done you can Publish the post to your live site (which will make it instantly available for visitors) or Save to Drafts to edit/publish it later. 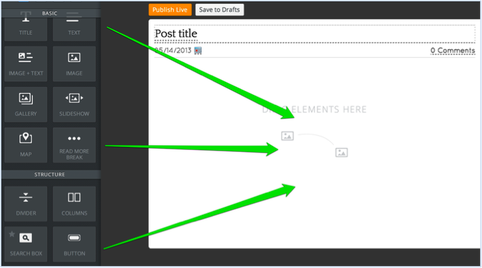 If you save the post as a draft, it'll be accessible to you through a drafts area at the top of the blog page from within the editor (along with any other drafts you've saved). Just click the link to the post from this drafts area to edit it further and Save / Publish. Every new post you publish will appear at the very top of the page, pushing older posts farther down. After you've added seven or eight posts to the page, older posts will be moved off the main page to still-accessible archive pages.